Walking near Old Town Square, I came upon the restaurant space where L'Angolo by Kogo used to be. 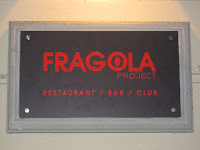 In its place was the new restaurant, bar, and club: Fragola Project. I peered through a window with a tacky decal of a picture frame around it and saw that the interior was quite different. 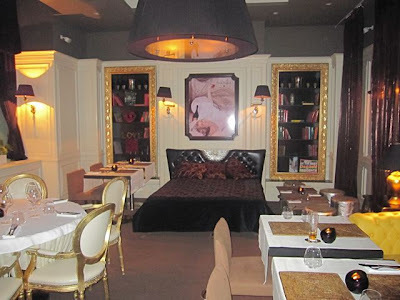 Instead of L'Angolo's mostly white theme, the dining room was now a mix of white, brown, beige, and gold. 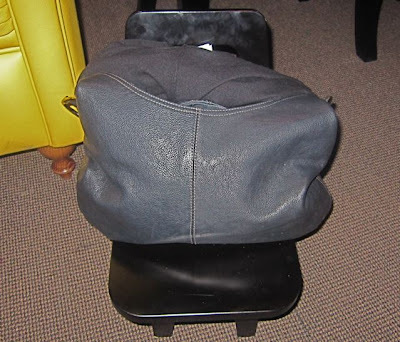 It was filled with overstuffed couches, chairs, and even a bed. A glance at the menu showed that the food prices were surprisingly reasonable. I later learned the restaurant is no longer associated with the Kogo restaurants. V and I returned for dinner on another evening with Jersey Girl and Mr. Big. Several things provoked comment right away. The ladies thought the special little chair to hold their bags was a nice touch. The soft couch on one side of our table was lower than the chairs. Aside from us, the room was populated by young blondes in black. And you have to like or be able to tune out techno music. Fragola's chef stared down from an over-sized photo on the wall, gripping a kitchen knife and serving fork. With his manic smile, I thought he looked like a man who should not be allowed near sharp objects. I then realized I'd seen him before. 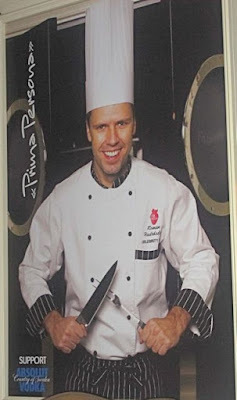 It was Roman Hadrbolec, the Czech Republic's self-described "first Celebrity Chef." Almost two years ago, we ate at his restaurant in Brno, Noem Arch (Noah's Ark). Sadly, it was not a happy experience. In summary, I called it style over substance. I also cited his comically narcissistic online biography, which breathlessly recounts his storied culinary career. You have to wonder about a guy who, near the top of his CV, mentions that he personally waited on Vaclav Havel for a day during a conference in a small Austrian village in 1993. Or that he was first runner-up in a Dallas swimsuit competition in 2000. We started off by ordering a round of drinks. 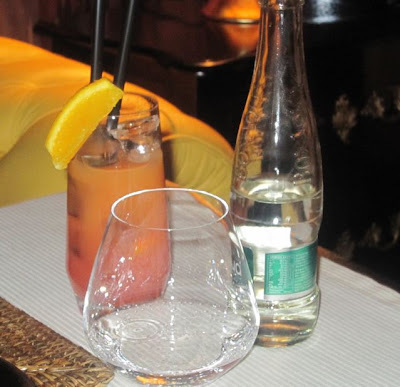 V and Jersey Girl had Campari and orange juice (135 CZK each). A .25 liter bottle of Bonaqua water was a soul crushing 50 CZK. Mr. Big had Jack Daniel's with ice (85 CZK). 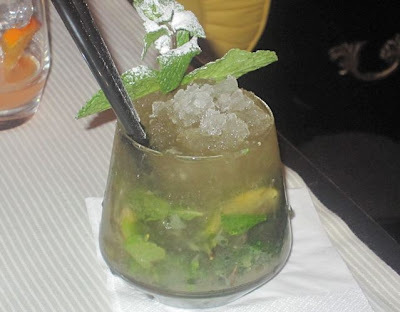 I went for a mojito (160 CZK). It was well-mixed. Though the cocktail was on the sweet side, I liked it. But with the glass filled to the brim with crushed ice, it was a pitifully small drink for the price. I began to realize that while the food prices were reasonable, they really nail you on the drinks. 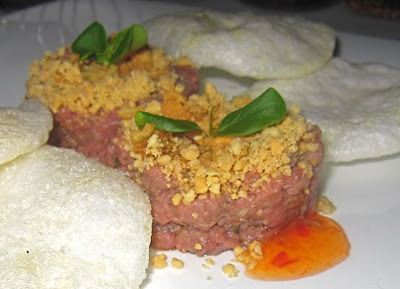 For an appetizer, Mr. Big and I both ordered Roman's Special Asian Steak Tartare (115 CZK). The two small circles of coarsely chopped beef were coated with crushed peanuts and mixed with ginger. I thought the Asian take on this dish worked surprisingly well. But it was not perfection. We both thought the beef needed salt, which was fixed easily by adding soy sauce. The meat was not the finest quality, being slightly chewy. And there was the ubiquitous sweet Thai chili sauce on the side. 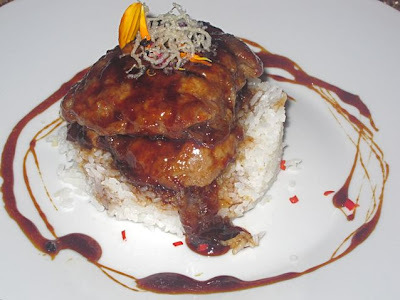 The menu also offers Moravian specialties, but we all stuck to Asian fare. V got the unfried spring roll stuffed with crab salad (80 CZK). I warned her that for the price, it would be imitation crab, but she ordered it anyway. Unsurprisingly, she described it as an imitation crab salad roll with basil. The Thai chili sauce made a repeat appearance. The good news was it was tightly rolled and held together, unlike the disastrous, over-sized and unraveling spring roll we had at Noem Arch. 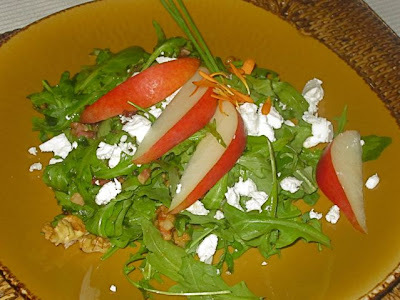 Jersey Girl had the rucola, goat cheese, and pear salad (90 CZK). It came with a honey-mustard dressing and walnuts. The salad was insubstantial in size, but tasted fine. 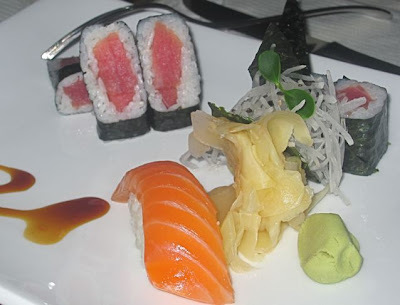 I wanted to test the restaurant's sushi skills, so as a second appetizer, I ordered tuna maki (110 CZK) and one salmon nigiri (75 CZK). The rolls were well-made and the fish was fresh. I enjoyed the buttery salmon. However, its pillow of rice crumbled on me immediately after I picked it up with my chopsticks. Still, Mr. Big thought it looked good and ordered the same for himself. 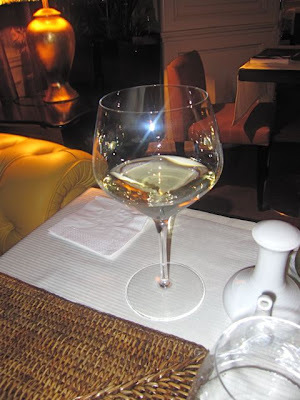 V and Jersey Girl ordered glasses of red and white Moravian wine (70 and 80 CZK). Both said they were quite good for domestic. 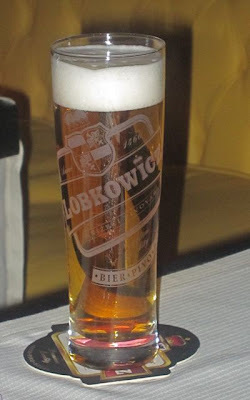 Then, Mr. Big made the mistake of ordering a beer, a .3 liter glass of Lobkowicz. After he ordered, I mentioned that I'd heard the beer was very expensive. After it was delivered, he spoke to the waiter. "Excuse me, how much is the beer?" "It is 150 Czech crowns." "What? That has to be against the law. Isn't there a law against charging that much for beer?" The waiter was confused, so V explained the comment. He said he was sorry, but if it was any consolation, the two .75 liter bottles of Badoit mineral water were only 120 CZK each. Not really. That was the most expensive beer I've seen in Prague. 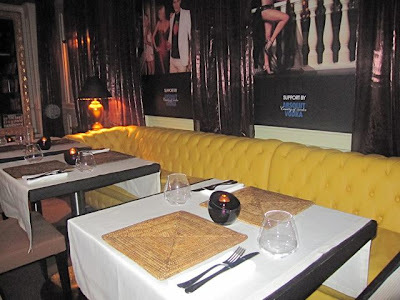 For our main course, Mr. Big and I both had Roman's Signature Orange Beef with basmati rice (210 CZK). I very much enjoyed this sticky, sweet, sour, and salty dish. The two pieces of butter tender meat looked like more than the 150 grams promised on the menu. 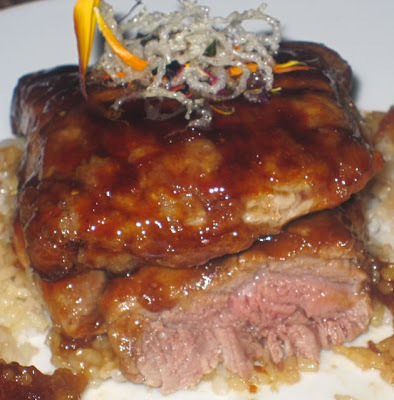 Under the orange and oyster sauce reduction, the beef was rare to medium rare. That's how I like it, though the waiter didn't ask. I thought the sauce, itself, was quite similar to that found on the orange beef at a Panda Express in Atlanta's airport. Don't get me wrong, I love the stuff. But it may not appeal to everyone. 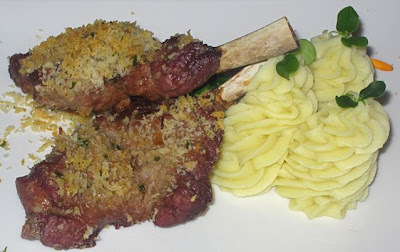 V had the Miso Lamb Chops with Lime and Parsley Crust (260 CZK). The two pieces didn't look much like lamb chops I've seen before, with the meat flattened out at the ends of the two bones. The lamb was very tender, but quite salty and with only a hint of the expected gamey lamb flavor. The bread crumbs were very buttery, but I didn't taste the lime. It came with wasabi mashed potatoes, which were on the sweet side. Jersey Girl had the prettiest dish, the Signature Sea Bass Marinated in Miso and Sake (175 CZK). It was surrounded by square pieces of red, green, and yellow peppers. V and I had little bites and both of us thought it tasted fine, though again, the seasoning didn't come through so well. 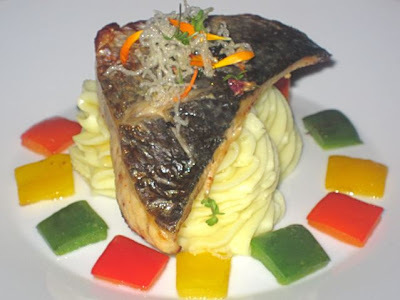 However, Jersey Girl was unhappy with the flavor of the sweetish wasabi potatoes which stuck to the fish. Oh, and she insisted that I register her complaint that a velcro strip along the bottom of her chair ripped her good stockings. 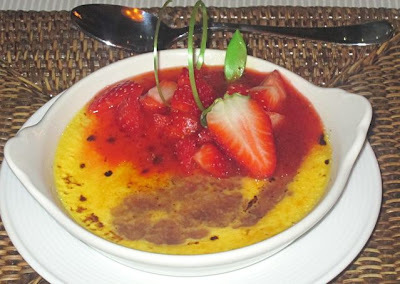 For dessert, I ordered the strawberry crème brûlée (120 CZK). This was not a particularly good version. It had a loose, slightly eggy texture that did not match my creamy dreams. 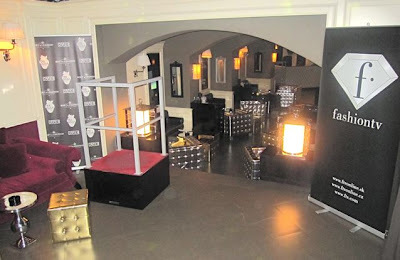 Now, the main attraction for many will be Fragola Project's downstairs club. 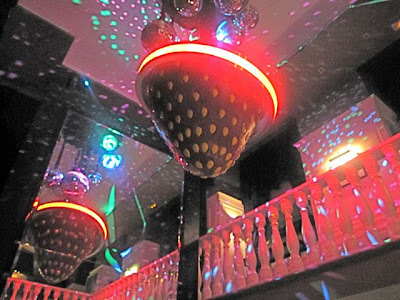 To get there, you pass under a giant strawberry (which, in case you didn't know, is what fragola means in Italian). Since I'm not the biggest expert on this scene, I turned to my dark and dashing friend, Flash. He's a veteran clubber with a well-proven ability to successfully navigate these dancing dens of iniquity. Flash told me he'd been to Fragola Project a number of times. The main reason: Lots of good-looking women. His impression was that there were a lot of young ladies from former Soviet countries, along with "the type of men they attract, including expat men like myself, but also some scary dudes." He said the club, with its advertising posters on the walls, felt very Russian. Which makes sense since one of the owners is Russian. There was muscle working security at the front door, and he thought they exercise "face control" at some points in the evening. Flash said "a few handlers walk around making sure big spenders and VIPs are being taken care of." 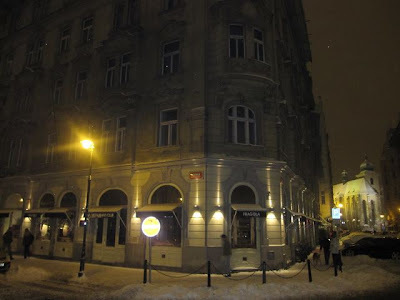 It's been very crowded on weekends, partly because it's a "new place to go for young Czech professionals." The dance floor is quite small, and Flash told me the music has been house/techno with occasional hip-hop mixed in. For more on what it looks like, you can check out Fragola Project's Facebook page. Upstairs in the restaurant, it started filling up with pre-club diners after 9:30 p.m. That's when we were leaving. 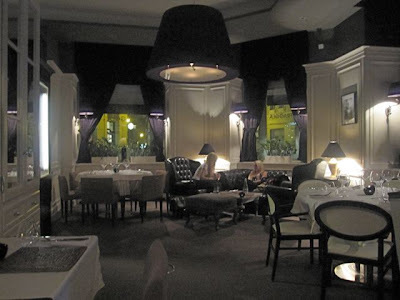 For our part, we spent close to 1000 CZK each in the restaurant, including tip. We thought the service was polite, but occasionally awkward, and our waiter went missing a number of times. If you cut back on extravagances like having more than one drink, you could have dinner for half what we spent. 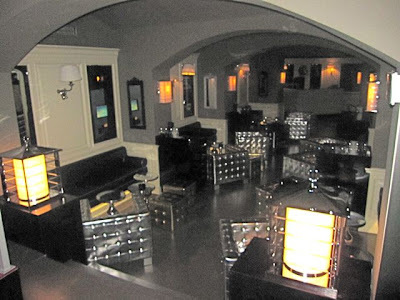 But if you aren't into this kind of lounge scene atmosphere, then this is not the place for you, no matter what it costs. When it comes to quality and sophistication, the cooking at Fragola Project will probably never match the fame of its famous chef. That's to be expected when you raise expectations too high. But if you are a wayward girl or just in the market for one, then it's the place to be. That is a nice touch for the purses. There's a superstition where I live that if you put your purse on the floor, you will become poor. Now I will even dine with my purse on my lap if there's not a good and/or safe place to put it. I hope the tartar was better than it looks; that is not an appetizing color! And what is up with the thai sauce everywhere? That used to be the case in Budapest a couple years ago, but thankfully that seems to have passed. Hopefully it shall pass there too. Nice write-up; I felt I was there with you! this place looks as painful as a gulag.